How can we take responsibility for our ONE World? 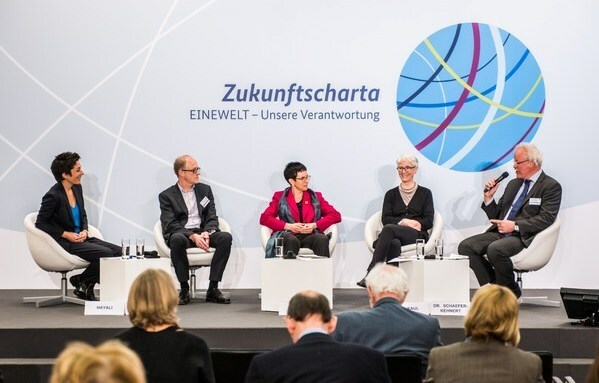 To answer this question, the German Federal Ministry for Economic Cooperation and Development (BMZ) initiated a dialogue process that is unique of its kind. In a first step actors from civil society, economy, government, science, and church exchanged their ideas during a kick-off event in Berlin. In a second step, the dialogue has been opened to the general public – by establishing an online dialogue. Until 9th of September all German citizens can actively engage for a better future by joining the online dialogue here. Aim of the process is to design a common document, the so-called “Zukunftscharta” that is based on a participatory approach. The Zukunftscharta shall serve as a guideline for future initiatives with respect to the post-2015 development agenda. Besides it shall lay the foundation for activities in the next year, which has been entitled ‘the year of development cooperation’. The dialogue is structured around the four dimensions of sustainability: social, ecological, cultural-political and economic as well as global partnerships. At the kick-off event, five forums were set up to explore future possibilities in each field. The Collective Leadership Institute moderated the forums and also steered the discussion in the field of global partnerships. Establishing global partnerships for development – this has been defined as one of the Millennium Development Goals. With world population at seven billion people and more interconnected and complex challenges a new spirit of cooperation is imperative. The purpose of the global partnerships forum was therefore to specify the roles and responsibilities of the actors involved. The Zukunftscharta will be officially published November 24th and the measures identified towards ‘taking responsibility for our ONE World’ will then be implemented. Do you wish to bring in your ideas? Join the dialogue here!